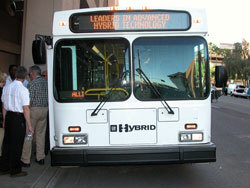 One of the ways we moved people here at the Congress was with a Hybrid Bus that took us out to the opening reception. The Clean Cities Congress & Expo is about to kick off and so is our coverage here on Domestic Fuel. One of the organizations exhibiting at the show is the National Biodiesel Board. I just visited their office yesterday since I’ll be helping NBB Director of Communications, Jenna Higgins, with a media training workshop on Sunday and we were looking at some camera equipment. So I asked her a couple questions about why the NBB is involved and what she’ll be teaching her workshop participants.